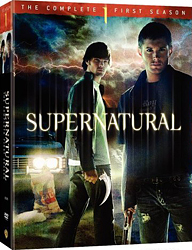 On Disc 6, under the Special Features Menu, highlight "A Day In The Life Of Jared And Jensen." A bar in the upper righthand corner will turn yellow. Use the RIGHT selection key to highlight. Selecting this will play a message from Eric Kripke, the creator. Go back to the 'Special Features' section and highlight the menu entry for the 'Still Gallery.' Press the 'Left' arrow key now on your remote control to highlight Dean's eyes. If you press the 'Enter' key now you will be treated to a short clip with two alternate, unaired title sequences.